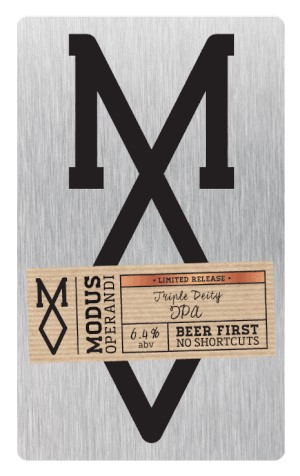 On the occasion of its third birthday, Modus Operandi officially joined the haze craze. Sure, they’d previously added some yeasty fuzz to a batch of XPA and partaken in some collaborative cloudiness down on the Yeast Coast, but this represented their first concerted solo push into the murky realms of the New England style IPA. It’s called the Triple Deity, it looks like the leftovers in the sink after you've cleaned a paintbrush and it tastes like a piece of citrus fruit bitten right off a tree. Indeed, on a scale of beer to breakfast juice, this sits somewhere towards the “freshly squeezed” end of the spectrum; it’s all about the juicy grapefruit and pineapple flavours and a long bitterness. Needless to say, you need to add a lot of high quality hops to get such strong characters bursting out and, by the brewer’s calculations, there’s one and a half kilograms of dry hopping in every keg of the beer. As well as making the flavours stand out, that also means their next bill from the hop supplier will be a doozy. Just as well you can get away with spoiling yourself on your birthday.